String Jumping Exercises really pay off. Many grooves have fourths in them and if you are able to execute those string jumping movements with ease and an even sound, then your groove and feel will benefit immensely. Here are a few exercises to help you with that movement. It will pay off majorly in the phrasing of any groove! Saw you at a seminar on Scott’s Bass Lessons about a month ago. 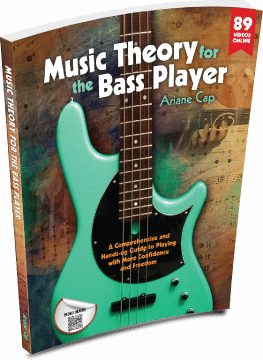 Just received your music theory book today. It looks great and I look forward to using it. Just visited your site today and see you have some excellent lessons and tips here also. Appreciate all your efforts to help us improve. Thanks! I’ve been following the book fairly well, enjoying it and learning a lot. I’m on the inversion of intervals right now ( pages 51 – 54) and am struggling to understand these concepts. Can you cover in more detail in a future video? Thanks! Your comment helps. My confusion is definitely related to ascending/descending intervals versus inversion of intervals as you describe. I think I need to sit down and draw it all out. I’m an engineer so I think very analytically and need to see things with diagrams. Thanks for the quick response and I look forward to the future video!